CROUT, HENRY, settler in the first English colony in Newfoundland; fl. 1612–17. Nothing is known of Crout’s life beyond the Newfoundland venture; his name suggests a Devonshire origin, but in 1612 he was living in Lambeth. In February 1612 Crout purchased, for £20, a half-share in the London and Bristol company for the settlement of Newfoundland, which had established a colony two years previously under John Guy. He was apparently drawn into the venture by Sir Percival Willoughby, a subscriber to the company in 1610. Crout went to Newfoundland to represent Willoughby’s interests there and to act as guardian to Thomas Willoughby, Sir Percival’s son. In May 1612 Crout reached Renewse, and in August he took up residence at Cuper’s (Cupids) Cove whence he wrote a series of letters to Willoughby, recording his generally favourable impressions. He considered Newfoundland suitable for settlement – potentially fertile and promising mineral wealth, drugs (such as sarsaparilla), and a fur trade with the Indians such as that established by the French in Canada. Any criticisms which he made were of the company rather than of the country: he particularly questioned the practice of sending out apprentices rather than skilled men. Crout said surprisingly little of the colonists’ day-to-day activities but did describe the raids of Peter Easton, the pirate, on the fishermen. Two journeys which Crout made to Ferryland to negotiate with Easton led to his being accused by Willoughby of too great a familiarity with the pirates. Crout’s main duty was to explore the land which Willoughby hoped to receive from the company, namely the peninsula dividing Conception and Trinity bays, north of a line drawn from Carbonear to Heart’s Content. At first, hindered by lack of a boat, he relayed to Willoughby the reports of fishermen who told of tracts of good, open land, woods frequented by deer and beaver, and harbours teeming with fish. 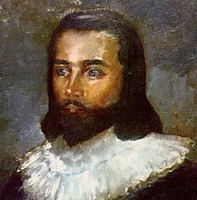 Having failed to reach Trinity Bay overland, in October Crout went on the coasting expedition, led by Guy, which made contact with the Beothuk Indians there. The winter of 1612–13 was spent at the settlement where he was evidently a person of some importance, for he was appointed to keep the colony’s official journal (Middleton MSS, Mi X 1/66). This was primarily a record of the weather; each day wind direction, periods of sunshine, rain, or snowfall, and the severity of frost were noted. The terms used are subjective but the trends of the weather are apparent. The journal is an invaluable document, unique for this date. Furthermore, it provides a wealth of detail on the colony’s life during that hard winter. By the early months of 1613, Willoughby was already critical of Crout for not having undertaken more extensive exploration. That spring he did return to Trinity Bay but the Beothuks proved elusive. Crout was prepared to winter again in Newfoundland but, by August, it had been decided that he should go to England to report more fully to Willoughby. Apparently he remained in England until 1616, but by May of that year he was again in Cuper’s Cove. Willoughby’s desire that Crout establish a separate settlement on his land at Carbonear was frustrated by lack of men. Crout spent that winter in the island but Willoughby was increasingly dissatisfied with Crout’s management of his affairs, and especially with this new delay. It seems probable that Willoughby recalled him, for nothing more is heard of Crout in Newfoundland and by 1619, Willoughby had a new agent there, Thomas Rowley. Crout’s letters, his journal, and other papers relating to him form part of a collection of documents on the first English colony at Nottingham University, Middleton MSS, Mi X1/1–66. For accounts of the colony see: Purchas, Pilgrimes (1905–7), XIX. Prowse, History of Nfld. Rogers, Newfoundland. Gillian T. Cell, “CROUT, HENRY,” in Dictionary of Canadian Biography, vol. 1, University of Toronto/Université Laval, 2003–, accessed April 26, 2019, http://www.biographi.ca/en/bio/crout_henry_1E.html.